Held every 3 years, World Sustainable Built Environment Conference 2017 Hong Kong (WSBE17 Hong Kong) is the world conference of the 2015-2017 cycle of the distinguished SBE Conference Series, and this is the second time the world conference is held in Asia after Tokyo in 2005. The Conference will offer a truly inclusive platform for participants to share leading knowledge and exploring new solutions for creating a greener world. At least 2 members from other subjects such as natural sciences, sciences, social sciences, economics, etc. Shortlisted entries will be presented to a team of renowned international jurors. The winning entries will also gain global exposure and have a chance to get displayed to over top-notch industry experts, policy makers, academia in WSBE17 Hong Kong Conference and Exhibition. 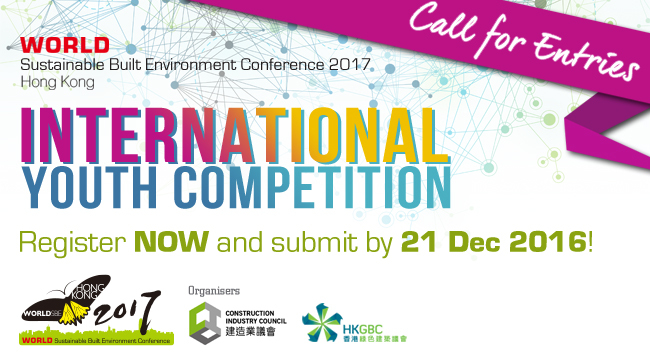 Don’t miss the chance to present your brilliant ideas at one of the world’s most influential sustainable build environment conferences!